From low-angle rappels to lowering heavy loads - this device does it all! The Conterra SCARAB� TI Ultra versatile descent control device, CNC machined from solid Titanium plate, represents five years of research and testing by Rick Lipke and the design team at Conterra. Also available in a Stainless Steel model for Fire Rescue use - see the SCARAB 'FR'. The SCARAB was born out of the need for a small, simple device that could easily control heavy rescue loads, as well as excel at pick offs, twin rope systems and other general rescue techniques. The SCARAB does all this and more. It is incredibly strong and simple to use. Weighs less than 7 ounces! The SCARAB� is the perfect choice for both Fire/Rescue and back country rescue environments. 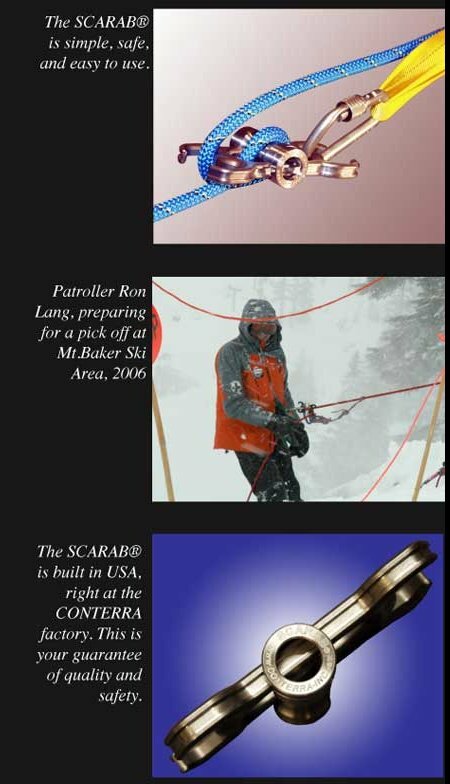 SCARAB� is a registered trademark of Conterra Inc. All rights reserved U.S. and Foreign Patents Pending.